Former New York Savings Bank, now CVS on the corner of 14th and 8th. 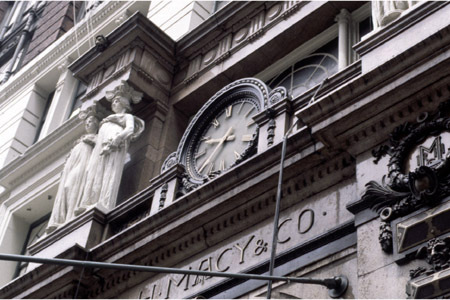 The "beehive clock" (beehive is the symbol of thrift) is secured to the wall about twelve feet above the sidewalk, there is a two-faced electric clock (plate 9). Each of its faces has a round dial in a leafy molding within a fluted. Square frame and spandrels decorated with bees. A glazed vitrine occupies the lower half of each face. Twisted colonnettes at the case's corners support a Roman molding cornice. 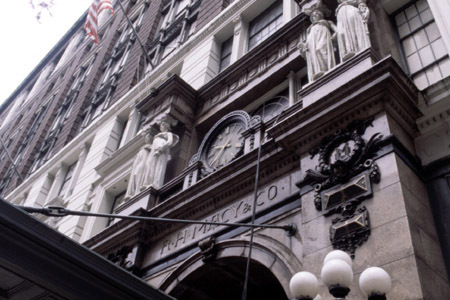 Link to landmark preservation PDF. New installation discovered October 2016. Link to the church website. Photo: Tom Bernardin, Wayne Beugg, June 2001. Working digital Tolex Clock at Tourneau. Photo: Tom Bernardin, Fall 1999. Minerva & The Bell Ringers. One of three mechanical clock in NYC. Restored by 34 St BID 1999. Maintained by Marvin Schneider, NYC Clock Master. Self Winding clock installed in the 59th Street Subway station at Columbus Circle. In front of the Lincoln Center is the eighteen-foot tall TimeSculpture, installed in Dante Park in 1988 and approved by the Art Commission of the City of New York to enhance the space in front of the city’s famous opera and ballet theatres. 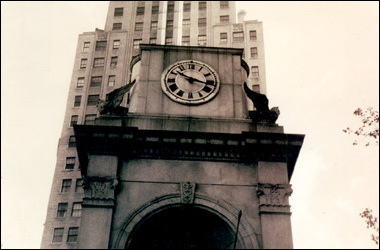 The TimeSculpture has three larger faces at its top with one smaller clock on one side at the bottom. The Movado Corporation helped with the installation and provides financial assistance for the maintenance to keep this modern art timepiece ticking.